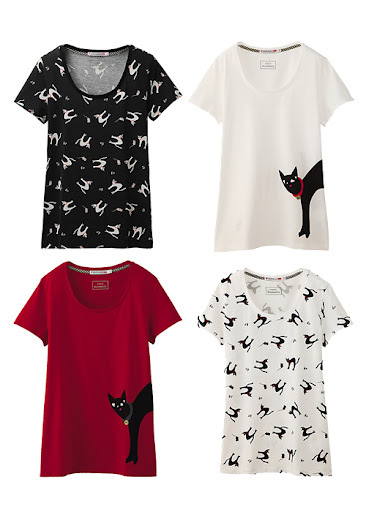 UNIQLO, the leading casual clothing retailer in Japan, has recently included some catty new additions to the UT Project, their limited-edition collection of t-shirts designed by renowned artists, designers, photographers, and more. Their current collection boasts an impressive array of pop cultural icons such as Andy Warhol and Barbie, but two collaborations in particular have us purring like the cat who got the cream. 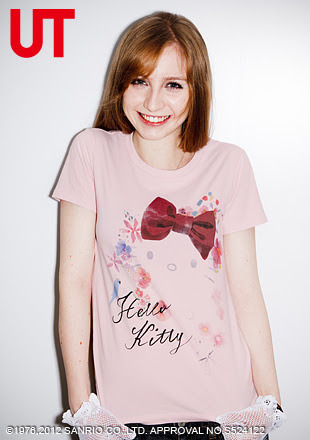 The first offering is the ten piece Hello Kitty collection, which features artsy takes on the famous feline - from watercolor renderings, to her image made out of cake frosting. My very favorite design, however, is a cute-bordering-on-creepy portrait of two realistic white cats, clutching their very own Hello Kitty dolls (seen above). British accessories designer Lulu Guinness (I wrote about her cat umbrellas, coin purses, and totes in a recent post for Catster) also has a black-cat heavy line of fashionable tees for the internationally known brand, that will have you asking "Jason Who?" after the whole Target debacle. 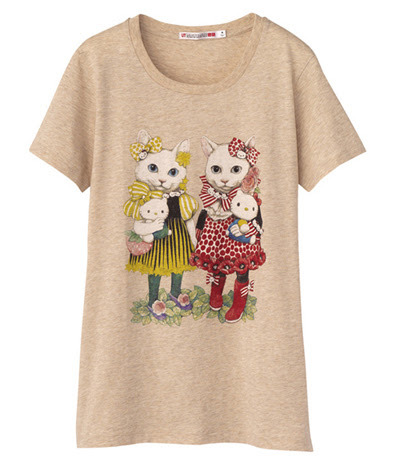 My purrsonal pick is the all-over kitty print tees, that take a boring t-shirt from "blah" to "aww!" While each piece rings up at just under 20 dollars, sadly, fans won't find the shirts available for sale online. While you can torture yourself by browsing both collections on the web, you'll have to hit one of Uniqlo's retail shops to pick up some unique cat fashions of your own. OH MY GOD, BLESS YOU STEPHANIE. That shirt...I need it more than anything I've ever needed in liiiife. I am actually going to Japan in like...2 and a half weeks and BY GOD I WILL FIND ONE.